A local firefighters union filed another unfair labor practices complaint against Crook County Fire and Rescue last week and is seeking several civil penalties. 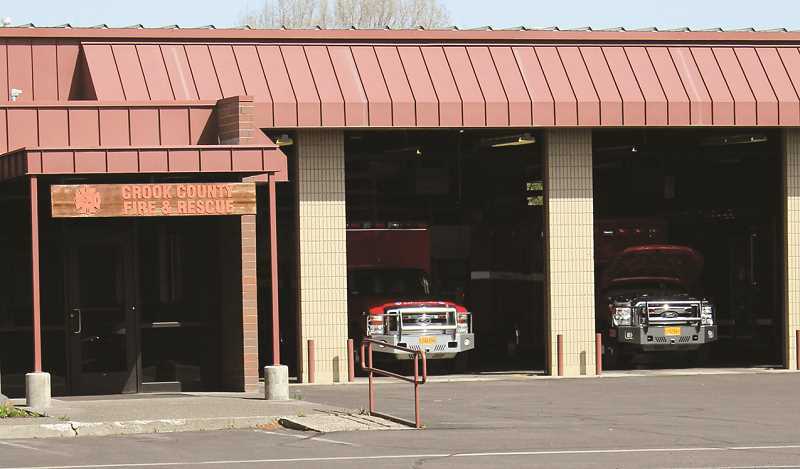 The complaint was filed by Crook County Firefighters Association, a union comprised of multiple CCFR employees that was formed in September 2016 in response to ongoing workplace concerns. This is the second complaint filed with the Oregon Employment Relations Board against CCFR in the past calendar year. The first complaint was settled before a hearing took place. The document provides a history of the union-forming effort, which originated in late 2012 amid "a variety of workplace concerns." "CCFR supervisors responded negatively to these efforts, actively opposing the formation of a union from the very beginning," the complaint reads. "As time progressed and the employees continued to discuss forming a union, this opposition grew and escalated to threats of retaliation." When asked about the complaint, Fire Chief Matt Smith had very little comment other than saying the district "does not agree with the presentation of fact" in the complaint, but that they "respected the process" and the union's right to be heard. The association went on to highlight a situation in early 2013 in which CCFR leadership announced that employee timesheets would be changed to reflect 212 hours of time worked per pay period. The document claims that leadership provided little explanation for the change, which resulted in a pay increase, but facing questions, Chief Smith "acknowledged that CCFR had been violating the Fair Labor Standards Act and that they had made the changes to comply with the law." The complaint went on to allege that Smith admitted CCFR had been aware of the problem for a period of time but management had not corrected it in a timely manner and was "refusing to give back pay for the full period of time that CCFR had been violating the FLSA." Employees reportedly threatened to sue if they were not paid what they were owed, and CCFR then agreed to pay the employees. "This is one example of the type of concerns about working conditions ..." the complaint stated. The FLSA situation prompted more discussions among employees to form a union, and Smith continued to make anti-union statements and threats about what would happen if employees formed one, the association alleges. "Smith threatened employees that he would 'have to' enforce the rules more strictly and take away flexibility from them if they exercised their statutory right to form a union," the complaint reads. The association stated that employees continued in 2014 to try and work with Smith to improve workplace conditions, but those efforts came up empty. And as concerns persisted into 2016, employees once again began discussing formation of a union, a plan that ultimately came to fruition. The complaint alleges that in the short time since the union was certified, "Smith has engaged in a pattern of unlawful retaliation against employees that engaged in protected association activities." "Specifically, Chief Smith has begun initiating formal investigations into workplace issues that never would have resulted in an investigation before the association was formed," the document stated. "In contrast, Chief Smith has responded to other more serious allegations of misconduct involving supervisors or non-supporters of the association informally and often without any discipline at all." The complaint goes on to allege that Smith has repeatedly refused to promote employees that he considers active in, or supportive of, the activities of the union, and has instead preferred to promote employees who are openly critical of the union. The document went on to recount when it filled its fire marshal vacancy in February 2017 by promoting Russ Deboodt, who had been an administrative assistant and not a member of the union. Then in April 2017, according to the complaint, Smith announced he would create two new battalion chief positions. Two captains, Jerimiah Kenfield and Dan Freauff, were later promoted to fill the positions, employees who had "been open opponents of forming the association." "The BC positions were not filled using an open and competitive process, and the promotional opportunities were only made available to the Chief's preferred candidates," the document states. "As a result, the association filed an unfair labor practice (complaint) against CCFR. The ULP was later settled before hearing." As part of that settlement, CCFR agreed to fill the two vacant captain positions in the fall of 2017 and they were opened for internal and external candidates. Association President and CCFR Lieutenant Chad Grogan applied for one of the positions, as did another candidate whose name was not disclosed but was identified as a non-supporter of the union. That candidate and another external candidate were hired, and Grogan subsequently met with civil service representatives to review the scoring for the promotion. According to the complaint, Grogan only scored low marks in the interview portion, which was conducted by Kenfield. A union member reportedly asked Kenfield why Grogan failed the interview portion of the process. "Kenfield responded that he could not speak much about the process, but that 'when you have spoken negatively about an organization in the past, that is what happens,'" it was reported in the complaint. Following the promotions to captain, CCFR sought to fill the vacated lieutenant position, which was filled this past February. "Chief Smith decided not to select the top candidate on the civil service list," the complaint stated, "but instead chose to promote the second-place candidate. This decision was met with surprise and consternation by many CCFR employees as (the top civil service candidate) scored significantly higher in all objectively scored components of the testing process. However it is well known that (the second-place candidate) is not supportive of the association but is close with Chief Smith and BC Freauff. Much like the situation where Grogan was not promoted, the applicant who did not support the association scored significantly higher in the panel interview than the other candidates." The association claims that it is entitled to a civil penalty because "Chief Smith's conduct was intentional, conducted over a long period of time and was flagrant and egregious." The union is also requesting CCFR be required to cease and desist from committing any further unfair labor practices described in the complaint, and be required to conduct a new promotional process for the most recent lieutenant promotions, "but without demoting or reducing the pay for the individual who was selected for the promotion through the improper procedure." In addition, the association is requesting that the Oregon Employment Relations Board require Smith and all battalion chiefs to attend multi-hour training sessions on the rights of employees to engage in activities protected under Oregon Revised Statute. In spite of the dispute between the association and CCFR leadership, Smith stressed that local fire service would not be compromised. "While this process goes forward, the district and its employees and volunteers will continue to provide the best possible service to the citizens of Crook County," he said.